Those picking up the July issue of Official Xbox Magazine will find a three-page spread detailing some of the content and additions gamers can expect out of Neversoft’s Guitar Hero 6 (now known as „Warriors of Rock;“ read below) effort, which is scheduled to clash with Rock Band 3 later this year. None of the features introduced in GH5 – jump-in party play, mixing and matching instruments, playlists, etc. – have been removed from GH6. The main career mode will be shaped into more of a story mode, which focuses on the game’s signature characters. The characters set out to defeat „The Beast,“ an entity that has defeated the God of Rock in battle. With the God and his guitar now powerless, the characters set out to defeat The Beast. The story progresses with the standard cutscenes, all narrated by KISS’s Gene Simmons. In the story mode, each character has an ability that carries over into gameplay – for example, Lars Umlaut can achieve a 5X multiplier without star power and Johnny Naplam cannot fall below 2X multiplier. When players reach an encore, the characters transform into an altered warrior form that extends these abilities even further (the example OXM cites is Lars morphs into an animorphic boar and can now reach 6X multiplier without star power). When the player completes quest mode, a „quick play plus“ opens up, allowing players to use these forms and abilities outside of the story. This mode also extends the song-specific challenges established in GH5. In GH6, each song has 12 individual goals to accomplish, extending the total possible number of stars in a single song to 40 and, evidentially, imported songs and DLC purchases will be formatted to implement unique in-song challenges. Players can access a leaderboard with an option to jump into a game with the same perameters in an attempt to best their score. When attempting to beat a friend’s score, the HUD has an additional indicator that shows the player’s progress toward beating the score. Performance is also tied into a ranking system that tracks status, with OXM making a parallel to Call of Duty: Modern Warfare 2’s system. A „share“ option is also being implemented to forward high scores to friends. GH6 will keep tabs on how often you play certain songs and will suggest DLC content that is similar to the genres or bands played most. A song progression bar, detailing how much time is left in a song, has been added to the HUD. More song-sorting options, such as instrument-specific difficulty and earned stars are being added. OXM also teases another song in a small footnote – Megadeth’s Dave Mustaine will be creating an original track. The song is titled „Sudden Death“ and it will serve as the final song in quest mode. If you are interested in the July issue, it has been delivered to subscribers and should be available in stores soon. Official Xbox Magazine’s official site can be found here. Finally, while it isn’t in the July issue of OXM, which refers to the title as Guitar Hero 6, other sources are indicating the title will be known under a different title when it releases. 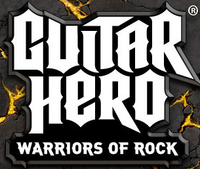 An official Guitar Hero Web site splash page beckoning visitors to sign up for newsletter updates now has the title identified as Guitar Hero: Warriors of Rock, which fits with the quest mode theme. We’re sure this is yet another title we’ll be hearing more about at this year’s E3, so keep checking back for more updates. Zdroj: McCaffrey, Ryan, „Finding the Soul in Rock ‚n‘ Roll,“ Official Xbox Magazine, Future, July 2010.